From the beach, the walking group made their way up through the forest to the Pacific Ocean side of George Island. There, they would find an almost forgotten gun site from WWII. The pathway up to the gun site was only completed in 2012. 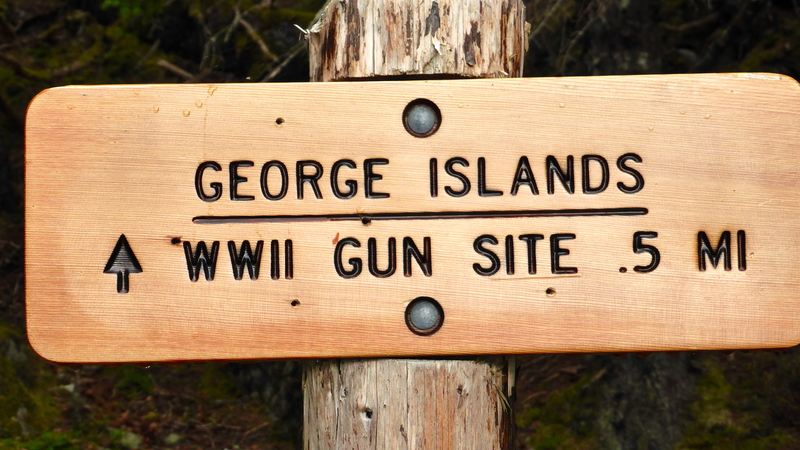 Before then, this was a rather forgotten part of World War II history in Alaska and the USA. The walk went by some delightful rocky coves. but it was only a light shower. a chance to stop for a bit of a rest. The group spared a thought for the men who pulled the gun up this hill. The higher the walk, the craggier the inlets. Rock ‘stacks’ were left by the pounding waves of many a storm. There were indeed big vistas, but there were also small plants to enjoy. This Aster sp. was delightful. As with all of the forest areas that we had visited, there was plenty of moss. Another rocky bay came into view through the trees. The Slender Bog Orchard, Platanthera stricta, is one of the Rein Orchards; stricta means slender. This one differs from the White Bog Orchard (photographed on an earlier walk) because it has green rather than white flowers. Another beautiful orchid found along this forest path was Listera cordata, commonly called Heart-leaved Twayblade. The pale green to purplish brown flowers have a long lip that is divided into two lobes. Each plant may have between 5 to 16 flowers that grow in a terminal elongated cluster. It grows well in a mossy, moist part of the forest. Apparently Charles Darwin was fascinated by this orchid because of the way it blows its pollen away in a explosive puff. The pollen, which is held within a drop of sticky fluid, glues itself onto whatever insect it lands upon, often a fly or a fungus gnat. The flowers lure these insects by having an unpleasant odour. So, they may be delightful to look at, but don’t touch or smell! One very different moss in this forest is Hylocomium splendens or Step Moss, so called because its stems are twice pinnately branched. The 3-5cm long, step-like annual increments are clearly visible in this closeup photo. The age of a step moss can be estimated by counting these annual ‘steps’. This moss likes calcium rich soils as opposed to the the Sphagnum Moss , that prefers acidic, organic soils. 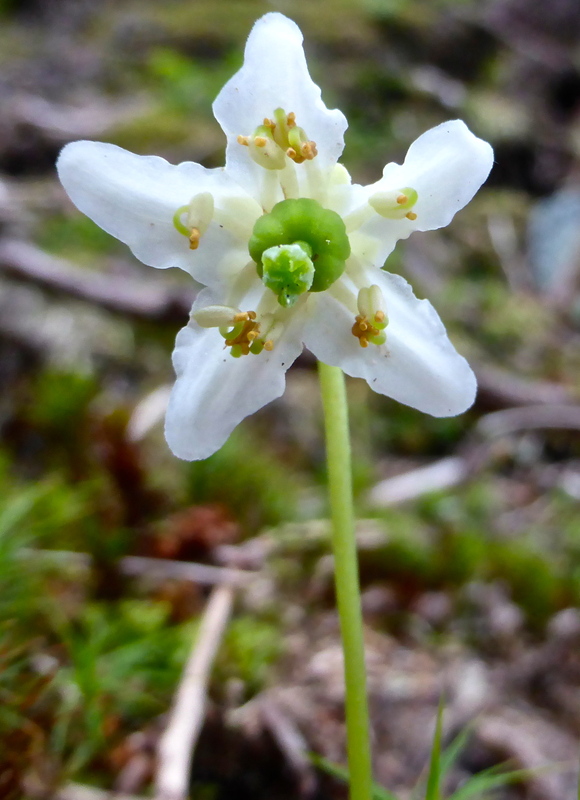 Deep in the forest where little light penetrates, David found the lovely Moneses uniflora. This plant, which is called WaxFlower, has two, perhaps more appropriate common names ; Shy Maiden and Single Delight. The latter refers to the single, white, fragrant nodding flower on top of a leafless stalk. The name Moneses derives from the Greek; monos meaning one and hesia meaning delight. And I think you’ll agree, it is a delightful flower. Another beautiful flower is the Common Butterwort, Pinguicula vulgaris. This plant grows in moist areas which low in available nitrogen. So it supplements its nutrition by trapping insects. The purple flower plays no part in catching prey and it’s held high above the leaves by a long stem, well away from the sticky insect catching leaves. The plant doesn’t want to catch its own pollinators by mistake! One of those amazing survival tricks of nature. Another one of those survival tricks relates to the way this plant catches and digests its food. The leaves have two special glands on the upper surface. One, the peduncular gland, produces a wet looking secretion that forms droplets on the leaf surface, hopefully luring a small insect in search of water. But it’s not water; it’s sticky and traps the insect. As you might expect, the insect begins to fight for its life, but that only triggers more glands to secrete more sticky droplets. This secretion begins the digestion process and that triggers an initial flow of nitrogen to the plant. And that brings into play the second type of gland, the sessile glands, which lie flat on the leaf surface. Those glands excrete enzymes which further break down the insect into digestible fluids that can be absorbed into the plant through special holes in the leaf. And that just leaves the insect’s exoskeleton on the leaf. And that’s just another example of what makes learning about plants so fascinating, don’t you think? In that same moist area, covered yet again in moss, there were more of the lovely Dwarf Dogwood; Cornus canadensis. This perennial plants forms a wide mat of oval leaves borne in whorls above the moss on erect stems. White, oval bracts surround tiny greenish flowers. These are followed by the red berries, locally called Bunchberries. The Butterwort and Dogwood were growing beneath trees above this rocky cove. And out beyond the cove, the Pacific Ocean stretches thousands of kilometres. And here at last was the gun; an eighteen ton (36,000 pounds) steel gun. Yes. ‘Twas indeed mighty effort to get it up here. But this gun was never fired in anger. The gun mount looks sturdy enough! people can leave their trash behind! What happened to the wilderness etiquette? Pack it in, pack it out! The ammunition was stored here. Not much was used! At least they removed the ammunition when they left the site. There’s not much to see here now. The accommodation quarters have seen better days. Life was tough for the gunners who were posted here. It’s a blustery, windy, often cold and wet place. Despite the rain, there was very little water; none in the winter, because it would freeze. 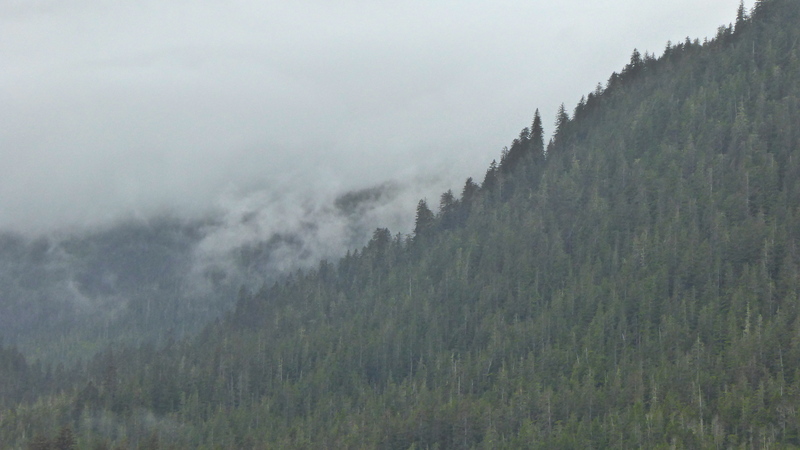 Most of the men went back to Sitka. Two men remained but it wasn’t long before they also locked up and left. Looking north from the gun site. One last look out across a bay to snow topped mountains beyond. As the walkers returned from the gun site, the kayakers also came back to the bay. One last task for the crew; return the kayaks to “Sea Lion’. The weather closed in again, but no one was concerned. Lunch was served.